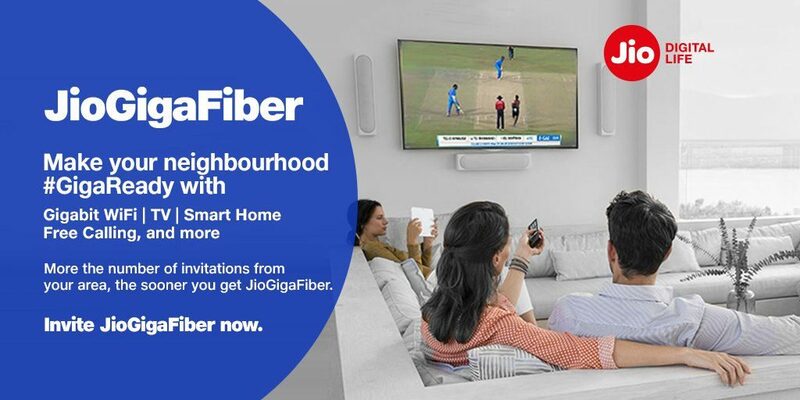 Reliance Jio today opened registrations for JioGigaFiber, its upcoming connected home solution that includes ultra-high speed fiber connection of up to 1Gbps with the GigaRouter, GigaTV Set-top box to watch Live TV, Smart Home solution, free calling and more. Reliance Jio says that more the number of invitations it receives from your area, the sooner you get JioGigaFiber. It has been running JioGigaFiber preview offer in most cities that offers 100Mbps speed for 90 days at one-time refundable deposit of Rs. 4500. The company already said that it will offer 1Gbps speed when the commercial roll out begins, which is expected later this year. The company has already completed cable work in most cities. The company at the announcement event last month said that JioGigaFiber will be the largest greenfield fixed-line broadband roll out anywhere in the world, with roll out happening in 1,100 cities of India simultaneously.